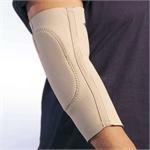 Uniform compression provides support and stability while heat retention soothes the elbow joint. Excellent in the care and prevention of throwing arm injuries and tennis elbow. Slight bent-arm design allows freedom of movement without bulk. PRO has cut down the standard 400 to a comfortable & convenient 7” long which is preferred by many linemen. Uniform compression provides support and stability while heat retention soothes the elbow. Slight bent-arm design allows freedom of movement. Lightweight aluminum hinges, fully enclosed in neoprene pockets. Two adjustable hook and loop straps in a criss-cross configuration allow the wearer to set the amount of extension control. Opening at the elbow eliminates pressure on the joint. ½” foam inner pad with a hard outer shell to provide maximum impact protection. Neoprene cover over the elbow shell meets the requirements of most ruling organizations, eliminating the need for extra padding. Ideal for Hockey, Baseball, and Football. ½” foam inner pad with a hard outer shell to provide maximum impact protection. Neoprene cover over the elbow shell meets the requirements of most ruling organizations. Pull-on design features top and bottom straps to secure the pad in place. 1/8” thick neoprene band provides therapeutic heat to the upper forearm while a ¼” thick orthopedic felt pressure pad applies pressure over the tendon insert point. 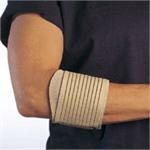 Elastic band wraps around neoprene band providing extra pressure to the forearm. 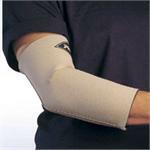 Form-fitting elbow sleeve features a shock –absorbing pad enclosed in a pocket on the inside of the sleeve eliminating and outer edges that might catch or fray on rough surfaces. 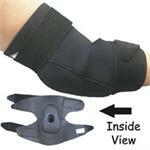 Provides excellent protection for the elbow and forearm. 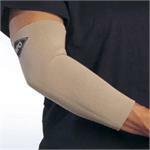 Same features as the 400 Elbow Sleeve with the addition of a 1” strip of loop-type material. This allows for specific placement of hook-and-loop strap for maximum benefit and compression over the tendon insertion point. 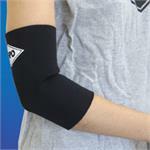 Patented design eliminates intersecting seams that typically cause skin irritation on the inside of the elbow. By placing a horizontal seam where the elbow naturally bends and the long seam on the outside of the elbow, the irritation is eliminated. 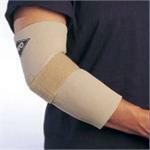 Brace is designed to aid in the prevention of elbow hyperextension. Easily accessible hinges allow user to set the extension stop point at 0, 15, 30 or 45 degrees. The hinges are enclosed and padded to meet the requirements of sports participation. Sleeve features a nylon lining for easy application. A contoured design assures a snug fit while also providing extra protection to the forearm. The outer neoprene skin grips the ball for extra grip making this a favorite of running backs and receivers.